Mat H. has recently confided to me happily that: “Yesterday Mat Hong Tuyen brought us some jackfruit. We are so thankful for your kindness. The jackfruit was so delicious, she did even peel away the outer layer before giving us” I asked her: “How could you know that she did?”.“I guess just from what I saw” Mat H. responded like she knew exactly the answer while the fact is that the jackfruit was peeled at Song Nguyen Tantra House’s base before being shared to different places. Did Mat H. see Mat Hong Tuyen was peeling the fruit? No. Did Mat Hong Tuyen admit that she is the one who did it? No. Then why did Mat H. jump to such a premature conclusion? It is about the subjective attitude before giving a speech, she let her mentality thinking intervene and decide before talking instead of being cautious. In Mat H.’s case, she had better just see whatever she meant to receive instead of paying attention to the person who brought the fruit. By her briskly inconsideration, she would exert bad influence for her future without any consciousness. In normal individual as well as social relationship, there will occur misunderstanding or mistakenness because of similar premature deducing conclusions. All human’s mental states are come into being by their self-inferential on the subjects who/which they are paying attention to. As a result, there are unreal sympathy and sentiment feelings has been raising for the subjects which should have not meant to be. It is also similar when it comes to the case of antipathy and insensitiveness. A Buddhist, or a Tibetan Buddhist using their special power (wonder-working) for their own purposes can be reasoned as devil delusion or non-Buddhist one. The Buddhist usually unintentionally build up their own Jneyavarana (hindrance of knowledge) by believing their thinking. Mat Cat Van who comes from the North once bared with me that because she kept chanting the “The guidance to practice Tibetan Buddhism” twice a day so the Dharma guardians support her by making it continuous rain for two hours so she did not have to go to meet her friend. Her private meeting with someone else is totally not related to me; as she kept maintaining her idea that way, she deserved to be sent away for years. Why? “The guidance to practice Tibetan Buddhism” was composed by Song Nguyen Tantra House with the purpose of attaining “happiness for this life, extreme happiness for the next life” goal. It has never been reserved for anyone’s personal motive with trivial amorous emotions in it. I would prefer choosing to let things go down to let them satisfied with their subjective and superstitious thinking. The rain itself has its own reason in which lay the strength of all sentient beings karma, not just one individual’s desire. Furthermore, how can a Tibetan Buddhist whose cultivation period has not even reached six months with the mind is full of consequent delusion, disobedient attitude toward Guru’s teachings and advices, the laziness and heedlessness while practicing Dharma work that miracle? Whatever delusion in which a Buddhist, or a Tibetan Buddhist in particular use their special power (wonder-working) for their own purposes can be reasoned as devil delusion or non-Buddhist one. By that way they will be reborn into six realms of Samsara, the situation is exactly “more harm than good”. So, you had better let nature take its courses in which the fact should not be seasoned with any further qualities or characteristics based on your own way of thinking. When you are having a good meal, just feel the happiness of tasting delicious dishes. You do not need to make a reference to the cook, the restaurant as well as the ingredients. When you are travelling to a beautiful site, listening to a master piece of music or surveying a wonderful painting, an old antique or a statue, just enjoy their beauties as they literally are. Don’t pay too much attention to the unrelated topics by sticking with them many “reasons” and questions accordingly. Dear Buddhahood, please don’t let me lose my way into a poor externalist (it means following the method that the Buddha had advised including Astangika-marga which consist of three awakening factors: Renunciation, Bodhicitta and Emptiness). Dear my Guru, on a par with any Buddhahood, please pay attention to me (it means Guru is the intermediate point who connect the disciples to the Visesa world (Extraordinary) of the Buddha, Bodhisattvas, Buddhahood because “being close to the true spiritual friends will help decrease your bad karma while developing your Virtues”). Once the Buddhist keep praying in mind and in words, they shall gradually abandon the habit of giving a subjective opinion based on their own thinking or deduction while accessing anything or any phenomenon. I would like to advise my disciples for not letting your logical thinking be indulgent toward its flow that way. Many disciples had left Song Nguyen Tantra House because of breaking this kind of canon. Phuoc Thanh Village, 07 July 2015. 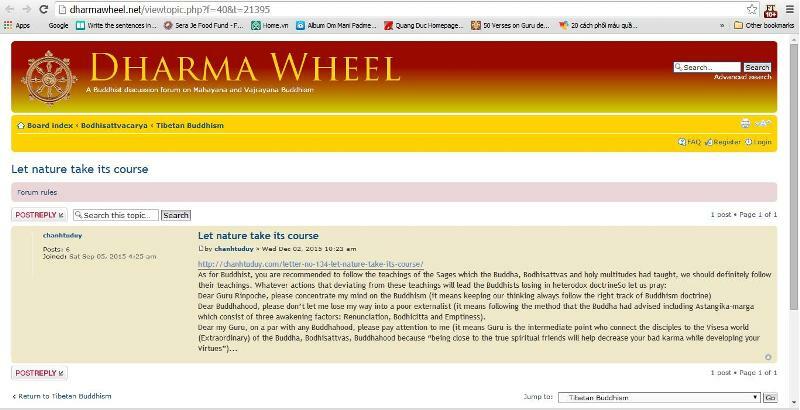 “Let nature take its course” is one the most useful discourses on the site of chanhtuduy.com. Our Guru has taught us the way to live a peaceful and happy life. We often attach to feelings as if they define us, and ironically, not just positive ones. If we have wallowed in regret or disappointment for years, it can seem safe and even comforting to suffer. In trying to hold on to what’s familiar, we limit our ability to experience joy in the present. A moment cannot possibly radiate fully when we are suffocating it in fear. When we stop trying to grasp, own, and control the world around us, we give it the freedom to fulfill us without the power to destroy us. That’s why letting things be as they are is so important: letting things be as they are is letting happiness in. Thank you so much for your translation in order that I can read this article one more time. May you have a happy life and make progress in the cultivation path. May all sentient beings attain the enlightened state. Pháp đệ tán thán thiện hạnh của Đạo huynh Mật Từ đã dịch nhiều bài viết của Thầy. Đệ cầu nguyện trí tuệ Đạo Sư luôn soi sáng tâm trí chúng sanh! Trò đảnh lễ Thầy mình! Mật Hải hoan hỷ với thiện hạnh của đạo hữu Mật Từ vì đã chuyển tải lời dạy của vị Thầy mang thông điệp của Đức Phật đến với bạn bè năm châu qua phương tiện Anh ngữ. Xin tán thán công đức của đạo hữu trong việc tuân hành Mật giáo giới số 01 mà nhờ đó chúng sanh thêm phần lợi lạc. Chúc đạo hữu sớm thành tựu nguyện ước chính đáng nhờ sùng kính vị Thầy, trân quý giáo pháp. Cầu mong “hộ pháp Alibaba” sớm xuất hiện để cùng với pháp đệ Mật Từ trợ duyên đắc lực cho công cuộc hoằng pháp của vị Thầy tâm linh. Chúng con thành tâm cầu nguyện Thầy Cô trường thọ để thêm nhiều chúng sanh được thoát khổ luân hồi. I’ve read through this article. Thank you for the writing about this topic. I often have to remind myself( not easy at all) I’m seeing things not as they are, those things are interpreted in my mind based on my memory / experiences and also influenced by natural selection,etc.. And many thoughts are coming in moment by moment. May our Guru and Dakini live long for the sake of all sentient beings. Yes, that’s why the Buddha ever taught that “Dear the disciples, do not trust your own thinking until you attain the full Enlightenment” (Sutra of 42 sections). After reading this article,i hav observed that nothing in this world is good or bad. For example if we think that a person is bad,we ll alws find him bad,no matter how good the person is to you. So it is alws important to cultivate the Buddha nature. So thank you for sharing the article so that i and all the sentient beings may attain enlightenment. I have read the lesson 134.I am thankful for your wonderful article. There is nothing good or bad in this world.It is how we perceive those.Even in the most beautiful situations a person with negative thoughts can find bad things.So when we interpret anything in this world the best thing to have is Buddha’s nature. I have read the lesson 134.I am thankful for your wonderful article.Anything will be good or bad depends upon how we perceive those.Even in the most beautiful situations a person with negative thoughts can find bad things.So when we interpret anything in this world the best thing to do is analyze that without any prejudiced thoughts. Con đã đọc bài viết này rồi ạ. Đây là một bài viết rất hay. Con cảm tạ ơn Thầy! Con cầu nguyện Thầy trụ thế lâu dài vì lợi lạc của chúng sanh. I am Tantra Mahajan (Nhuận Ravindra Mahajan). I read this article. I like it very much. I know that I should gradually abandon the habit of giving a subjective opinion based on my own thinking or deduction while accessing anything or any phenomenon. May all beings free from sufferings. I am Tantra Mahajan (Bhushan Ravindra Mahajan). I read this article. I like it very much. I know that I should gradually abandon the habit of giving a subjective opinion based on my own thinking or deduction while accessing anything or any phenomenon. Con là Tantra Mahajan (Bhushan Ravindra Mahajan). Con đã đọc bài này và con rất thích. Con hiểu rằng con nên dần từ bỏ thói quen chủ quan của mình trong trí kiến, quan kiến, luận kiến trước diễn biến của sự vật, hiện tượng. Con đã đọc bài viết này rất nhiều lần và con cảm tạ Thầy đã viết bài này bắt đầu bằng một câu chuyện rất ý nghĩa. Con cảm tạ ơn Thầy đã cầu nguyện cho học trò chúng con tránh rơi vào những lỗi lầm nêu ra trong bài viết. Sự vật tốt hay xấu đều do sự phóng tưởng của tâm chúng con dựa trên sự nhận xét qua lăng kính của cái ngã. Chúng con không nên đưa ra nhận xét, đánh giá theo tâm ý chủ quan vì điều đó không đúng bản chất của sự vật hiện tượng. Phật pháp giúp chúng con nhìn nhận được bản chất chân thật của mọi sự vật hiện tượng. Thông thường chúng con hay có những nhận xét đánh giá ngay cái nhìn đầu tiên hay trong lần tiếp xúc đầu tiên đối với mọi sự vật, hiện tượng. Tất cả mọi pháp hiện hữu xung quanh chúng con giúp chúng con có những bài học quý giá nếu chúng con khôn ngoan nhìn nhận được bản chất của chúng hoặc tạo cho chúng con tin theo tâm ý chủ quan mà đánh giá đẹp, xấu theo lăng kính của bản thân. Những giáo lý của đức Thế Tôn dạy chúng con sống hòa hợp với mọi sự vật, hiện tượng, nhìn nhận bản chất của chúng không tốt, không xấu vì vậy chúng con không nên đánh giá chúng theo tri kiến chủ quan của mình. Ngoài ra, chúng con không nên bám chặt quá khứ và không nên tin rằng mọi vật đều bất biến, thường hằng bởi tất cả đều vô thường cùng thời gian. Chúng con tin vào con đường Đức Phật đã chỉ ra và cho dù chúng con tương tác với mọi sự vật hiện tượng, chúng con nên hiểu giá trị của chúng trong từng thời điểm và hân thưởng, an trú hiện pháp. Con cầu nguyện cho sức khỏe và sự trường thọ của Thầy. Con cầu nguyện Thầy gia hộ để chúng con hiểu được những giáo huấn sâu xa trong kho tàng Phật pháp của Thầy. Cầu nguyện tất cả chúng sanh được bình an và cầu nguyện đau khổ của tất các chúng sanh được lắng dịu. One of the principal views of Buddhism is that of “dependent origination”. The fact that there is causality (cause and affect) in all of phenomena leads the Buddhist to come to a full understanding of its feelings of pain and pleasure and other such experiences that control their lives. Buddhist’s turn to the doctrine of karma, which provides an explanation as to how this experience effects the mind, the body and the speech. Tantric literature, as well as the Sutra’s, are wonderful for discussing the subtleties of the mind and consciousness. By using specific meditative yogic practices, one can effect the various states of consciousness. The ultimate nature of mind is essentially pure. “Clear light” is the technical name for this pristine nature, according to Tantra. When the mind is conditioned by afflictive emotions such as desire, jealousy or hatred, the sentient being is then caught in the cycle of existence (Samsara). By applying these appropriate meditative techniques and practices, the individual is able to fully experience this clear light (Pure Mind) and that eventually leads to true liberation and full Enlightenment. Buddhism truly is the science of the mind. By following renunciation, bodhicitta and emptiness, the sentient being becomes truly happy, filled with joy and experiencing pure tranquillity. Freeing the mind of subjective thinking is very liberating and something all students and disciples at Song Nguyen Tantra House should aspire to. Following the teachings of our esteemed Master Thinley Nguyen Thanh is a great way to start that road to (Pure Mind). Blessings to all! Om Mani Padme Hum 😊Tantra Citta (Jeffrey Bernard Forest). Một trong những luận điểm chính của đạo Phật là “nhân – quả”. Trên thực tế, nhân quả (gieo nhân – nhận quả) tồn tại trong mọi sự vật hiện tượng đã giúp Phật tử hiểu được nguồn cơn của phiền não, hạnh phúc và các trải nghiệm khác để có được cuộc sống cân bằng. Khi Phật tử học về nghiệp quả, họ sẽ hiểu được những tập khí cũ sẽ tác động đến hành vi thân ngữ tâm. Trong kinh điển Mật thừa, có viết về sự vi tế của tâm và nhận thức của chúng sanh. Bằng cách thực hành những phương pháp yoga cụ thể, hành giả có thể chuyền hóa trạng thái tâm. Và mục đích tối thượng là đạt được tâm thanh tịnh. Kết nối với “tịnh quang” là phương pháp khởi đầu giúp hành giả đạt được mục đích tối thượng của tâm thanh tịnh. Khi tâm dính mắc với cảm xúc phiền não như ham muốn, ganh tỵ, thù hận, thì chúng sanh sẽ mắc vào vòng tròn luân hồi sinh tử. Bằng cách thực hành những phương pháp kết nối với tịnh quang thì hành giả sẽ dần dần có được tâm thanh tịnh và đạt được giác ngộ tối thượng. Đạo Phật là môn khoa học về tâm. Bằng cách thực hành 3 tinh yếu giác ngộ, xả ly, bồ đề tâm và trí tuệ tánh không, hành giả sẽ đạt được hạnh phúc, an lạc và thanh tịnh. Từ bỏ tri kiến chủ quan giúp con người thoát khỏi đau khổ và đây là điều học trò chúng con tại Mật Gia Song Nguyễn luôn muốn được thực hành. Tuân theo lời dạy của vị Đạo sư tôn quý Thầy Thinley Nguyên Thành là cách tuyệt với nhất để bắt đầu con đường thực hành để đạt được tâm thanh tịnh. Con cầu nguyện bản thân con và các huynh đệ kim cang luôn nhận được ơn phước từ vị Thầy. Con cảm tạ ơn Thầy đã viết một bài pháp tuyệt vời với những luận giảng rõ ràng và vô cùng đơn giản. Con cảm tạ ơn Thầy đã cho con được đọc bài viết này của Thầy. Hỡi đại sỹ Liên Hoa Sanh, xin hướng tâm con về Phật pháp. It’s extremely important to be aware of our mind because it’s like a wild horse if it’s not dressed it takes were you don’t want go! That’s is the reason we ask our spiritual guide to take place in our head chiakra and protect our mind stream with is compationet blessings and to awaken our mind to full conshenes till we achieve our goal for the well fare of all sentient beings. May our spiritual guide have a long and healthy life. Con hiểu rằng nhận biết được tâm ta đang ở trạng thái nào là điều cực kỳ quan trọng bởi vì tâm con người vô thường, thay đổi liên tục như ngựa không cương như thuyền không lái. Nếu chúng con không biết cách đối trị thì tâm chúng con sẽ làm cho chúng con phiền não. Đó cũng là lý do chúng con cần có vị Thầy hướng dẫn, chỉ bảo để giúp chúng con quán xét và điều chỉnh tâm mình cũng như bảo vệ tâm của chúng con trước những điều bất thiện và theo đúng quỹ đạo chánh pháp nhờ sự từ bi để tâm và gia trì của Thầy. Đồng thời, nhờ sự chỉ bảo và để tâm của Thầy, tâm thức của chúng con được chuyển hóa, tỉnh thức dần dần khi thực hành pháp vì sự lợi lạc của hữu tình. Con thành tâm cầu nguyện Thầy khỏe mạnh và trụ thế lâu dài. many thanks for this teaching. I must take notice and enjoy the blessings given to me and not judge how they come about. I must be patient with my knowledge as I will not be aware of all things until enlightenment. i must use my prayers and practice for the benefit of all sentient beings and not for benefit of myself, this is where my calling and happiness lie. May my holy Guru have good health and live long for the benefit of all sentient beings. May all sentient beings achieve the happiness of Buddha ‘s nature. Con chân thành cảm tạ ơn Thầy đã cho con đọc bài viết này của Thầy. Con xin ghi nhớ lời Thầy dạy, hân thưởng cuộc sống, hân thưởng những gì đến với con mà không suy diễn về nguồn gốc cũng như không thêm thắt bất kỳ đặc tính nào theo tâm ý chủ quan của con. Con sẽ kiên nhẫn học hỏi, cẩn trọng, không tự ý lập ngôn vì con vẫn đang trên con đường tầm cầu giác ngộ. Đồng thời con sẽ thực hành pháp và cầu nguyện vì lợi lạc cho tất cả chúng sanh chứ không chỉ vì bản thân mình. Bởi vì nếu con chỉ ích kỷ lo cho hạnh phúc của riêng mình thì con sẽ không thể có được hạnh phúc chân thật. Con cầu nguyện Thầy tâm linh tôn kính xin ngài hãy để tâm đến con, chỉ bảo, dìu dắt và soi sáng cho con trên đạo lộ giải thoát. Con cầu nguyện cho sức khỏe và sự trường thọ của Thầy vì sự lợi lạc của chúng sanh. Con cảm tạ ơn Thầy đã để tâm đến con. Every article and every discourses on chanhtuduy.com that your holiness preaches is really a omniscient one. I truely gain the way to live with righteous attitude and thoughts. Your holiness letter no. 134 let nature take its course is indeed one of all best article and history your holiness had shared. Nothing is good or bad, but thinking makes it so… So as it is oue thoughts are in its natural state, so we should keep it. Nothing comes true if its not truth, its always meaningful think, speak and act the truth. One cant have the premature conclusion as your holiness shared through article. The true doctrine is to follow the teachings that buddha taught. So may all the disciples take naturally in way to be who they are by nature. So no hypocrisy at all. On the auspicoius day of lord buddhas first sermon day , daer your holiness please bless all and i to attain full realisation and ultimate truth. Please dont let get out of track of truth and pay attention to me dear guru..
Từng bài viết, bài giảng của Thầy trên chanhtuduy.com thể hiện rõ trí tuệ uyên thâm của Thầy. Nhờ đó, con thực sự được thực hành pháp với chánh kiến và chánh tư duy, theo đúng quỹ đạo chánh pháp. Bài viết của Thầy: thư gửi các trò 134: hãy để nó như đang là, thực sự là một trong tất cả các bài giảng sâu sắc, ý nghĩa mà Thầy đã cho con cơ hội được đọc. Con hiểu rằng bản chất sự vật vốn không có xấu hay tốt, chỉ có suy nghĩ chủ quan của con người gán vào nó nên nó trở nên xấu hay tốt dưới cách nhìn nhận của từng người. Vì vậy, chúng con nên nhìn nhận trạng thái đúng của sự vật hiện tượng, hãy để nó như đang là. Sự thật luôn là sự thật, không thể dùng suy nghĩa cảm tính mà thay đổi được. Vì vậy, chúng con nên quán xét hành vi thân ngữ tâm theo đúng quỹ đạo chánh pháp, để có cái nhìn nhận đúng về bản chất của mọi sự vật hiện tượng. Câu chuyện về việc kết luận vội vàng, khi không có đủ thông tin của đạo hữu trong bài viết này là một ví dụ minh chứng sống động. Phật tử nên hành xử theo thánh giáo lượng, là những gì đức Phật đã giáo huấn. Vì vậy, con cầu nguyện bản thân con và các huynh đệ kim cang không phóng tâm, thả ý mà hãy để mọi sự vật, hiện tượng như nó đang là, ngõ hầu tránh lầm lạc vào đường tà. Hôm nay, nhân ngày thánh lễ, ngày đầu tiên đức Phật thuyết pháp. Con cầu nguyện Thầy tâm linh tôn kính gia trì cho con và hữu tình giúp chúng con chứng ngộ chân lý tối thượng của đức Thế Tôn. Con cầu nguyện Thầy bảo vệ con, giúp con không đi lệch quỹ đạo chánh pháp. Hõi vị Thầy từ bi xin để tâm đến con! Con thành tâm cầu nguyện Thầy trụ thế lâu dài vì sự lợi lạc của chúng sanh. Cầu nguyện ngọn đuốc chánh pháp của đức Thế Tôn lan tỏa khắp muôn nơi giúp hữu tình được bình an. I am impressed with your comment. I love your writing. I feel clearly that you treasure the Guru’s teachings with gratitude. Although you live far away from the Guru, your mind always connects with the Guru’s mind through your devotion and your gratitude towards the Guru. It is a wonderful experience. I myself know that the Guru’s presence is the blessing to all sentient beings. And he creates the golden opportunity for all beings to connect with him on chanhtuduy.com. Reading and commenting on his articles on chanhtuduy.com, you, I and the learners all over the world can connect with him. In addition, we are guided to practice the Dharma by his wisdom and compassion. May the Guru and his consort have a good health and live long for the benefit of all sentient beings. May you achieve the happiness of Buddha’s nature. I am looking forward to reading more of your comments. May all sentient beings free from suffering and its causes. Thank you very much for you another meaningful lesion. Pl. Guide me on my following observations. There is nothing good or bad in the world. But, There are, five fetters or hindrances which come in the way of person trying to achieve Samma Ditti, Samma Sankalpo, Samma Vacca, Samma Kamanto, Samma Ajeevo, Samma Vyayamo, and Samma Satti. These five hindrances are covetousness, ill-will, sloth and torpor, doubt and indecision. It is, therefore, necessary to overcome these hindrances which are really fetters and the means to overcome them is through Samadhi. But Samma Samadhi is not the same as Samadhi. It is quite different. Samadhi is mere concentration. No doubt it leads to Dhyanic states which are self-induced, holding the five hindrances in suspense. But these Dhyana states are temporary. Consequently, the suspension of the hindrances is also temporary. What is necessary is the permanent turn to the mind. Such a permanent turn can be achieved only by Samma Samadhi. Mere Samadhi is negative in as much as it leads to temporary suspension of the hindrances. In it there is no training to the mind. Samma Samadhi is positive. It trains the mind to concentrate and to think of some Kusala Kamma (Good Deeds and thoughts) during concentration and thereby eliminate the tendency of the mind to be drawn towards Akusala Kamma (Bad Deeds and Bad Thoughts) arising from the hindrances. Samma Samadhi gives a habit to the mind to think of good and always to think of good. Samma Samadhi gives the mind the necessary motive power to do well. Con cảm tạ ơn Thầy vì bài viết ý nghĩa. Con xin phép Thầy cho con được viết về những gì con được biết, con mong Thầy khai thị cho con. Không có gì tốt hay xấu trên thế giới này. Nhưng còn 5 chướng ngại xảy ra với của người tu khi Phật tử cố gắng thực hành để đạt được chánh kiến, chánh tư duy, chánh ngữ, chánh mạng, chánh nghiệp, chánh tinh tấn và chánh niệm. Năm chướng ngại đó là: tham dục, sân hận, hôn trầm, trạo cử, hoài nghi. Thiền định là cách để vượt qua 5 chướng ngại đó. Nhưng Phật tử cần phải thực hành chánh định chứ không phải thiền định. Chánh định và thiền định hoàn toàn khác nhau. Thiền định chỉ là sự tập trung. Khi thực hành thiền định, hành giả sẽ có được sức định nhưng 5 triền cái (chướng ngại) kia vẫn không được đoạn trừ tuyệt đối. Trạng thái đắc định tồn tại mang tính chất nhất thời vì vậy 5 chướng ngại kia cũng chỉ mất đi nhất thời khi hành giả vào định. Tâm chuyển hóa và đoạn trừ vĩnh viễn 5 chướng ngại trên chỉ bằng cách thông qua chánh định. Nếu chỉ thiền định thì không thể đoạn trừ 5 chướng ngại trên được. Tà định thì tâm không được chuyển hóa. Chỉ có chánh định tâm mới chuyển hóa. Chánh định giúp tâm tập trung, thiền quán và suy ngẫm về thiện nghiệp, từ đó loại trừ những ác nghiệp do 5 chướng ngại gây ra. Chánh định giúp hành giả thiền quán về thiện nghiệp, chánh định tạo ra động cơ tốt trong tâm vì vậy sẽ có những hành động tốt. I am Mật Thuận An. I have read this article. This is the best interesting article that I have read on website “chanhtuduy. Com”. Thank you so much! May the beings free from the sufferings. Most respected holy Guru ji! Once a holy and fluent very useful-meaning full lession came to read us. in this letter reasonable teaching given by holy Guru ji on day today happening things. this important letter reveals about antipathy and insensitiveness. We come to know about goal about “Happiness for this life and extreme happiness for the next life. for the Buddhist recommendation is follow the teachings of sages that is much more important. Once we come to know about” ariyo atthangiko maggo ” that is ashtangik marg. the basic fundamental principles of this to be followed regularly as a dharma practice. this is essential. May holy Guru ji live long for the ultimate piece of whole world. Om mani padme hum!, sadhu sadhu sadhu! Hôm nay, con được đọc bài viết sâu sắc và lợi lạc của Thầy tôn quý. Thầy đã luận giảng rất sinh động và con học được bài học sâu sắc từ bài viết này của Thầy. Điều con học được trong bài viết này nhờ sự luận giảng rõ ràng của Thầy, đó là: chính vì tâm lý chủ quan, do tự cá nhân mình suy diễn mà tạo nên sự ác cảm và vô cảm. Để đạt được mục tiêu: “an lạc đời này, cực lạc đời sau” thì điều quan trọng mà Phật tử nên làm là hành xử theo thánh giáo lượng. Theo con hiểu, Phật tử nên thực hành theo Bát Chánh Đạo là điều cần thiết. Bài viết của Thầy tôn quý: “hãy để như nó đang là” là bài viết sâu sắc, lợi lạc và thực tế dạy chúng con những điều quan trọng để có cuộc sống hạnh phúc và an lạc. Con cầu nguyện Thầy tôn quý trụ thế lâu dài để giúp tất cả chúng sanh trên thế giới này có được hạnh phúc miên viễn. I am very thankful for your selfless and meaningful words.i knew that everytthing in this world is made by our own perrception.from today onwards i will consider every situation wether good or bad as same because through this article i came to know that i should change my perception.may all sentient being reach to nirvana and may guru have beautiful life as always.thank you beyond sky and land. 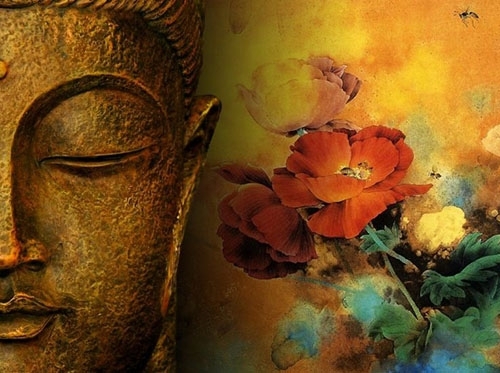 Lord Buddha has rightly taught ” Do not trust your own thinking until you attain the full Enlightenment. ” To attain this full Enlightenment , it may take long time or the whole life time depending upon one’s own Dharma practices and cultivation (Sadhana) associated with Renunciation, meditation and wisdom ! Hence, the short cut is as Buddha says in some other Sutra, ” Do not believe as your thinking or anything told by a teacher or a sage or narrated in Dharma Scriptures or even told by Buddha himself ! Unless it is personally Experienced by yourself ! It is made clear in this article, ” The guidance to practice Tibetan Buddhism” was composed by Song Nugyen Tantra House with the purpose of attaining ” happiness for this life ( which is most important) and extreme happiness for the next life ( which is not with in our reach now at present ). Here, right way of thinking is very very important.! Silenced by your profound article and it has a deep impact on the reader. One pertinent teaching of Buddhism is not to believe in our thoughts. We often cause ourselves to suffer by our clinging to the thoughts and views on something. Letting nature take its course is pure wisdom. Trusting and have resilience is the pure path of dharma. Applying the wisdom of this article is a blessing. Thank you for your constant guidance. May all beings be at ease and may all beings understand the pure dharma. I am a person of poor understanding. I could not understand the the purpose, import amd underlying meaning of this article in the first reading. I went on reading it again and again till I can make use of it. After several reading I found that it is pregnant with deep meaning, purpose and teaching. I extend my thanks to Rose Tran from the core of my heart for sending the lesion to me. Pretention, pride and prejudice as well as to show one’s own intelligence as superior, to influence others, is the habit of humans of average understanding. They try to smart over the situation and make realize others their importance, intelligence and superior capability. For that, they make overdoing through guess work, that often clicks but often makes their position ridiculous and suspicious too. In my early age I too did like these. But after going through the Buddhist text and tradition I realized that these a false practice, one should abstain from doing so. This lesson is the final blow on my pretentious attitude. I am thankful to my Guru for taking notice of even trivial things of his disciples so that one can mend and transform oneself and avoid the wrong path and mark a sublimation in their life. This is not a reminder to Mat H. but for all his all disciples who may get trapped on a wrong path in future because of their poor understanding and may purge themselves even from trivial mistakes. Nature goes in its own course. Things take place in the world in accordance with the law of the Dependent origination. The composing elements of the universe behave as per their own character. We often, out of ignorance , treat ourselves as doer, knower and creator of the changes, that is coming spontaneously all over. This mental over doing leads us astray and misleads from the holy path. Even one must not give that much importance to chanting mantras and and meditating that may make us forget the normal discipline of the order and ignore every one. Buddha has already gave us the reminder that the raft prepared for attaining emancipation is not the shore. One should not get glued to it more than the need and should not forget the common courtesy. If I water the mango tree 10000 big bucket daily, it will not start giving fruit in two or three days. Fruition will start in its season only. We must be cautious against it. Perhaps this has happened with Mat H. that made our Guru feel pity for him. Having unwavering in the Guru and the path is the prerequisite. On must not forget it. When ever we face any problematic situation we must pray the Guru to short it out. 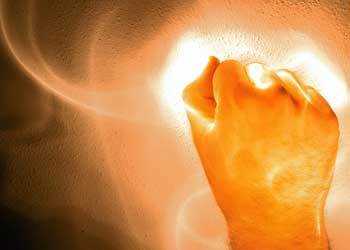 Even if we feel hindrance in concentration we must pray to him for making our concentration firm. This devotion and confidence in Guru, Buddha, Dhamma, and Sangha can make a devotee cross the ocean of worldly suffering and pave the path of liberation. I have read this article already. Thank you so much for your sharing. This article is so important the concept applies to every aspect of like does it not? My understanding is that you are telling us the trust life not to put an expectation on an event or taint it with the workings of our ego. We are to let life wash over us like a calm warm wave, we are to accept it wholly and openly and with through our practice and devotion to you and to Buddha we will be prepared to handle each situation with clarity and honesty. I feel a great joy reading this letter thank you. May all our Dharma friends be a little closer to enlightenment today. Tnx for the beautiful Teaching. Thanks for nice discourse no.134, I read it thoroughly the article and I remembered ” the Surangama Sutta” where Buddha taught to Bhikkhu Sangh to find the truth.or ultimate opinion or define the object which will be generalised in world than individual or subjective opinion. The subject should hurried to obstract the object. I like it you nicely explained carrying with the subject of ,who peeled out the Jackfruit, do not believe on heard anything or inferetial , what ever you desire to put before others it must be confirmed by testing with inductive and deductive method before declaration, which method was adopted by Buddha to define Thirst. Thank you very much for sharing such imooimpor lecture. I like this comment! Your contemplation is good. Con cảm tạ ơn Thầy đã cho con đọc bài viết hay và ý nghĩa là thư gửi học trò 134. Con đọc bài viết này chậm rãi và kỹ lưỡng. Sau khi đọc bài viết của Thầy con nhớ đến lời Phật dạy trong kinh Thủ Lăng Nghiêm, trong đó đức Phật dạy cho đệ tử của Ngài tìm ra chân lý tối thượng, bản chất của mọi sự vật hiện tượng vận hành theo nguyên lý khách quan chứ không phải dựa vào suy nghĩ chủ quan mang tính cá nhân. Con người không nên bám chấp vào bất kỳ sự vận hiện tượng nào. Con hoan hỷ với những luận giảng độc đáo của Thầy được minh họa trong câu chuyện người học trò nhận món quà của Thầy và tin vào tâm ý mình suy diễn người lột hết hạt mít mặc dù đạo hữu ấy không tận mắt thấy. Qua đó, Thầy dạy chúng con bài học đừng tin bất kỳ điều gì do nghe nhiều, do suy luận. Trước khi đưa ra kết luận bất kỳ điều gì thì chúng con cần phải kiểm tra bằng những phương pháp khoa học như quy nạp, suy luận với đầy đủ luận cứ, luận chứng thông qua thánh giáo lượng đã được đức Phật chỉ ra. So easy when the mind does not know that it automatically fills in the blanks on it’s own when it is unaware and racing. I see it all the time around me in my relationships. And I fear and am sure that it happens to me as well. This is why I am thankful for these lessons and have made it a point to have daily readings to keep myself on the path. I am fortunate to have the 3 jewels in my life. May everyone here have peace and good health. Nice message and kind teaching. I really enjoy it. Thank you. Bài viết của Thầy hay và lợi lạc với những lời chỉ dạy tuyệt vời thấm đẫm lòng bi mẫn của Thầy. Con thực sự rất hoan hỷ khi được đọc bài viết này của Thầy. Con đã đọc bài viết của Thầy. Con hiểu rằng hãy để mọi sự vật, hiện tượng như nó đang là. Con đã học được nhiều bài học quý báu từ những lời dạy tuyệt vời của Thầy. Con chân thành cảm tạ ơn Thầy đã nhiệt tâm viết bài chỉ dạy chúng con những điều cần thiết cho chúng con. Thank you these articles are always so informative. Thank you Guru for your wisdom. May you be blessed! Con cảm tạ ơn Thầy đã cho con được đọc bài viết trí tuệ này. Con cầu nguyện Thầy thân tâm an tịnh. Con đã đọc bài và hiểu được rằng phải nên nhìn sự việc như nó đang là. Thank you for this article. I bow my head on your lotus feet. It is very beautifully written in this article.we ignore many things just because of our personal world but the difficulty will come in future as we trap in a cage to be free out. I also have done many such things but after realising it hurts me. Budha also left home for truthness ,not for personal reasons.firtly I was too very quick advice giver but as I connected to guru, dhamma and Budha advicing less to others. Guru is very truly said”we always give emphasis on delicious food not the ingredients,cook,etc” but we should have to see from all perspective. I personally when going to eat delicious fast food on road side firstly seeing the cleanness of cook and how it is made then going ready to eat otherwise not.even I have less friends just because I less lie, not using vulgar words for showing new generation style,not giving their side when they are wrong,not going to masses, much more reasons. We all have to face ourselves. The thoughts come from our may not always be defenetly true. It must be experience many times to give advice to others. I am very much thankful and great fortunate to have guru like you.it is very very hard to find our the real truth guru like you.may guru lives long for sake of all sensient being.